Oil markets are trading flat this morning, unable to move higher but also stubbornly avoiding a return to lower levels. After opening below $57 yesterday, prices picked up 32 cents (0.6%) to close the day at $57.17. Crude prices this morning are currently unchanged from yesterday’s closing price. Diesel prices saw stronger gains yesterday, picking up 1.2% to close at $1.9469, a new high for the year and the highest price since summer 2015. Diesel is trading flat this morning, with the current trade at $1.9434. Gasoline prices have seen more volatility than crude or diesel, but the overall price movements have not been significant. Gasoline shed .75 cents (-0.4%) yesterday, and is trading flat this morning at around $1.8213. Markets are trading flat on lack of news to move prices significantly one way or another. 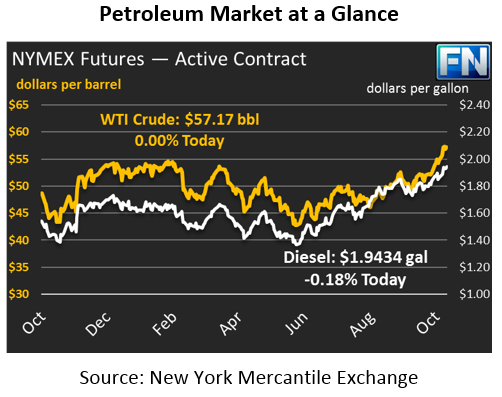 Virtually all of the headlines lately – Saudi Arabia, Iran, EIA data, OPEC cuts – have been bullish, helping to propel prices to their high levels. Markets appear to be running out of steam after rushing higher, and many are expecting markets to cool in the coming weeks based on technical analysis. On the flip side, geopolitical risk, especially in the Middle East, could propel markets even higher in the coming weeks.